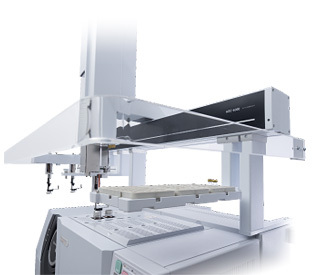 The AOC-6000 accommodates three sample introduction methods: liquid injection, headspace (HS) injection, and solid-phase microextraction (SPME) injection, enabling the analysis of samples in various forms. The system switches between sample introduction methods automatically, enabling continuous operation combining different sample introduction methods. By using the AOC-6000 with the OPTIC-4 multimode inlet, with its wealth of injection modes, pyrolysis analysis of solid samples, thermal desorption analysis of gaseous components, and a wide variety of other forms of samples and analyses can be handled. The AOC-6000 is controlled by GCMSsolution GC/MS software. Analysis accuracy control is easy since the AOC-6000 and GC/MS analysis conditions are stored with the measured data. An overlap function can also be used to heighten the efficiency of continuous analyses.